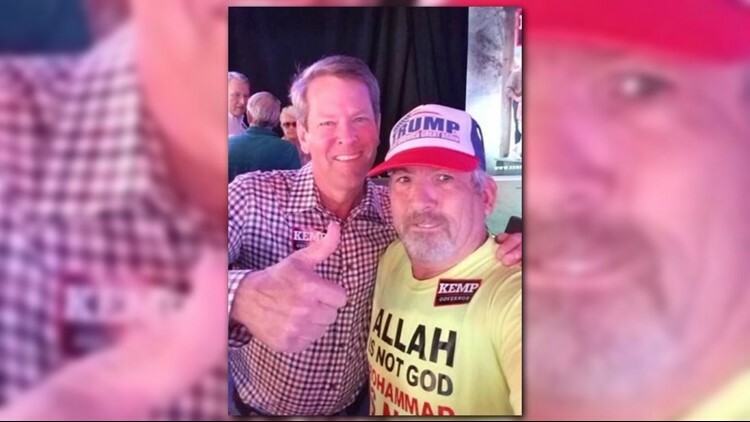 The man in the photo was wearing an anti-Islam shirt when he posed with Kemp. JEFFERSON, Ga -- Republican gubernatorial candidate Brian Kemp says he doesn’t share what he calls the "extremist" views of a man with whom he posed for a photo. The man is identified as Jim Stachowiak. He rants on YouTube about killing Black Lives Matter protesters. He was wearing an anti-Islam shirt when he posed with Kemp. Kemp was in Jefferson Monday, northeast of Atlanta. He was with Governor Nathan Deal and perhaps three hundred other people. Both men posed for countless photos. One photo that has surfaced from a previous event shows Kemp with a man identified Stachowiak of Augusta, who is wearing a shirt that says "Allah is not God." Atlanta’s former city council president, Cathy Woolard, says he’s a prominent white supremacist. "Despite wearing an obviously anti-Muslim t-shirt Mr. Stachowiak was able to take a picture with Brian Kemp giving the thumbs up to this nationally known white supremacist," Woolard said Monday. Woolard supports Democrat Stacey Abrams in the governor's race. Asked if he knows Stachowiak, Kemp said Monday "no I don’t. On these bus tours you can see (supporters) take hundreds of pictures you know – sometimes a day -- and I certainly don’t agree with his extreme views." Kemp and Gov. Deal say they’ve never screened wellwishers seeking photographs. "Politicians on a campaign trail don’t know who comes up to take a picture with them just as I don’t know the people today who might come and want a picture ith me," Deal said. "I think that’s what we’re expected to do." Kemp: Pres. Carter's call to resign "politics as usual"